My equine hobby started as a pony mad teenager, who managed to persuade my parents to buy me a pony, I competed various different activities mostly around the Pony Club (New Forest) Branch, including Camp at Salisbury Racecourse, various local shows but sadly my equine hobby was ended after a number of accidents which meant I had no confidence with ponies. Move forward a number of years I ended up living at a house that had a donkey called Marmaduke (Victor Meldrew character)as part of the contents, this started my new hobby of donkey ownership, this led to showing them in hand, breeding, taking a bride to church, being on Countryfile and eventually the hobby of carriage driving where Ive broken to harness my 2 large donkeys Rikita & Sarah. these have sucessfully competed in the show ring – Private Drive and Trade Classes (single turnout) and in Indoor Driving Trials as a Pair. November 2014 – BDS Leaf Spring Award Winner (1st Donkey competitor to win this award) 10 BDS organised events completed using the same turnout Rikita Du Bocage in the 1911 Norfolk Cart. During 2015, my 2 driving mares: Rikita & Sarah (being pure bred French Cotentin donkeys) spent 3 months on holiday in France living with a handsome Jack called Moustik du Suret, after being scanned (showing they were both in foal) they returned home, sadly Rikita lost her foal at some stage of her pregnancy, but her sister Sarah produced a delightful Colt foal, later named Monsieur Gilbert. 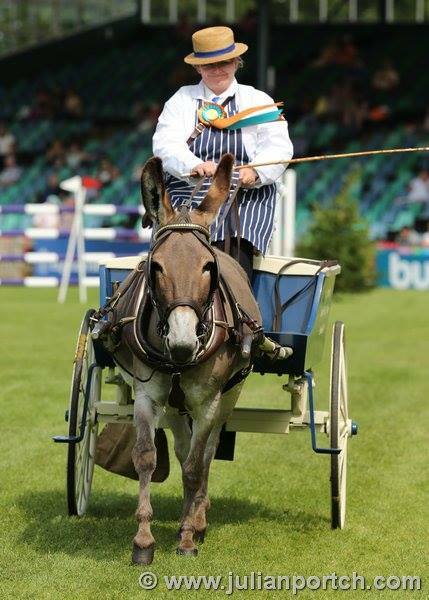 He completed 2 shows in 2015 (New Forest Show & Romsey Show) where he seemed to enjoy the experience. For the next 3 years Gilbert will be shown in hand & eventually he will be broken to harness. 2017 – Worshipful Company of Cartmakers 500th Anniversary Parade in London, Rikita took part in this Parade to celebrate that donkeys were originally used in work in the City of London. 2017 – Osborne Light Trade Qualification – Rikita gained this (1st time a donkey has qualified with a Light Trade Vehicle), we then competed in the Osborne Light Trade Semi Final at BDS Addington. Rikita also won the Donkey & Mule Class at BDS Addington. 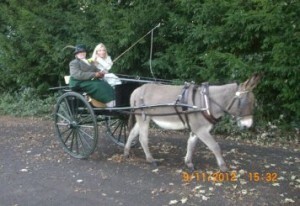 Look at our seperate pages Donkey Training & Donkey Driving for more details. Located in Hampshire with excellent road/rail and air links.